Gus Kenney is joining us today. Gus, can you tell us a bit about yourself and how many books you have written? 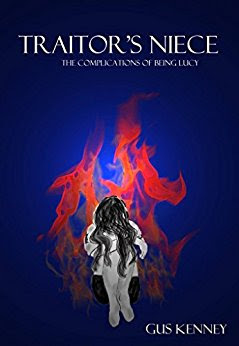 Gus: I have written 3 books as part of a YA fantasy series that I call the Complications of Being Lucy. It contains the titles, starting with the first, The Changeling and The Cupboard, The Changeling and The Borrowed Family, and Traitor's Niece. I live in western New York with my wonderful wife and our 3 puppy dogs. Me: Ah! A fellow New Yorker! ;-) What's the name of your latest book and what inspired it? Gus: Traitor's Niece is the latest installment in the Complications of Being Lucy and it continues the adventures of the main character Lucy Bison as she deals with a significant loss in her life. I wasn't originally inspired by anything other than continuing the series as intended, but it became more of a vehicle to deal with the losses in my own life that occurred during the year that I was writing it. Me: I'm very sorry to hear you've been dealing with losses, I hope things get better for you. What are you working on now? Gus: Presently I'm working on the next book in the series titled Daughter of Ash. I'm also trying to get another series started up but keep losing traction as soon as someone asks me about Lucy. Me: Juggling multiple series can definitely be a challenge. What authors, or books, have influenced you? Gus: House of Leaves by Mark Z. Danielewski and The Asylum for Wayward Victorian Girls by Emilie Autumn have been very influential as they showed me alternative ways to present a narrative to a story. Ways I had never considered before from reading fantasy growing up. The visual additives were also an interesting feature, just nothing I would ever have the talent to incorporate. Me: I agree, reading other people's work can definitely help you find your own voice in writing. What are you reading now? Gus: A girl (and I only call her that because she looks so damn young) that I met through the wonderful whirlwind that has been marketing my books, has recently completed her first book and I offered to give it a look over. So far it looks great and I hope it does well for her when it comes time for her to share it with the world. Me: That's wonderful! :-) Always good to hear more great stories are in the works. For those who might consider reading your book, what would you tell them to expect? Gus: The Unexpected! The characters and archetypes in the books are not your typical personifications. Creatures often depicted as monsters are now the heroes. It is an adventure story that ultimately has much to do with family. Me: Sounds like fun! :-) What is your favorite part of being an author? Gus: Writing. The power to create something from words is euphoric. Spinning stories from my mind is the best part of being an author. Me: Yes, there's nothing quite like the feeling when the muse is whispering in your ear and your fingers fly over the keyboard to bring the story to life. :-) Do you have a day job as well? Gus: Unfortunately. Four days a week I get to bury myself up to my elbows, or deeper depending on the task, into a grease pit that is supposed to be a locomotive and try to bring it to life. Me: Ha! Well, many of us have to bring a little elbow grease to make a living. ;-) What are the hardest and easiest parts of being a writer? Gus: Coming up with ideas is the easiest part–sometimes too easy. The hardest part is sharing the stories with the world once they are ready, because they never feel ready (or that just may be me). There always feels like one more tweek would make it perfect. Maybe just changing one little thing and it would be flawless. And you want them to be flawless because, like children, you want them to be accepted and not bullied. Me: Amen! :-) What genre do you place your books in? Gus: They are YA fantasy, though the YA part is slightly misleading. They are safe for young ones is all that really means. I didn't write the book to appeal to a specific demographic and have since found out that people of many ages have enjoyed it. The fantasy part is legit. Witches, elves, all that are in there. Me: That's awesome! :-) Is there anything else you'd like to tell your readers? Gus: Sorry for the delay on Traitor's Niece. I'd say it won't happen again but that would be a huge lie. I'm terrible with keeping deadlines. So expect Daughter of Ash sometime after the day you read this. That is as much as I can say for a time. And of course thank you all for the wonderful support. It has meant so much to me! Me: And so these fine folks can find your work, are there any links you'd like to share?